The Challenge: Design, cook, and implement a dinner menu for a backyard wedding with 80 guests and a budget of $1000. 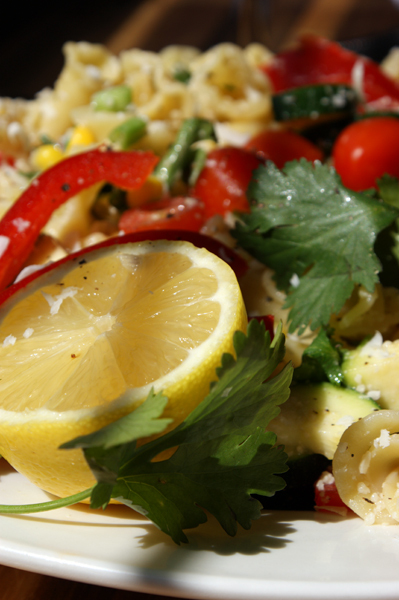 Today we test a recipe for a farm fresh pasta salad. I’ve begun the recipe testing phase for “The Wedding Catering Project”. I decided to start with testing pasta salad recipes because I love pasta, it’s been spring-y lately and pasta salad is spring-y. Plus… I totally feel like eating pasta. I had two recipes in mind for the pasta salad, pesto pasta salad and farmer’s market pasta salad, both from myrecipes.com. Both look really really good to me. I adore pesto and I think a lot of people agree with me on that one, so I feel like that has a lot of potential for a “picnic” wedding. I think we want dishes that will appeal as broadly as possible, to as many people as possible, without being boring. What I liked about the farmer’s market pasta salad is that it was just plain gorgeous, but more importantly it could be a really solid vegetarian dish if I omitted the chicken from the original recipe. I actually liked the original recipe when tested “as is” but, found I couldn’t help but make a few tweaks of my own. I, of course, omitted the chicken to make the dish vegetarian (though chicken works very nicely if you want to keep it when you make it at home!). I also found I wanted a lot more balsamic in the dressing, a bit more parmesan, and I also wanted a little less cilantro. For me the cilantro overwhelmed in the original version. I’m pretty satisfied with my version of the salad. As long as the bride and groom like it, I think there is a good chance it will make an appearance in the final wedding spread! I’m hoping that by the time we get to July and wedding-go-time, I can pick up all the veggie ingredients really fresh from my local farmer’s market for a really nice price. (Hence both the original and my version of the dishes name!) If this works out I think it can be a very nice, vegetarian friendly, low cost, fresh, summery, dish for the buffet. However, I would LOVE your feedback my friends! Give this one a try for me at home. 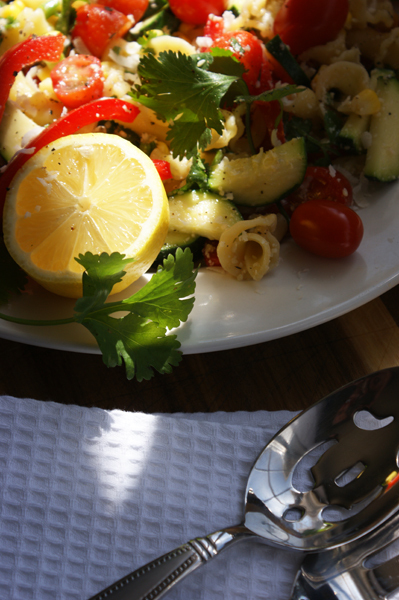 I think you’ll really enjoy it for a nice spring/summer dinner or side dish. But, I want your vote on whether or not it should make the final cut for the wedding. Let me know if you make any changes to your version that I should try. I can’t wait to hear from you all! 1. 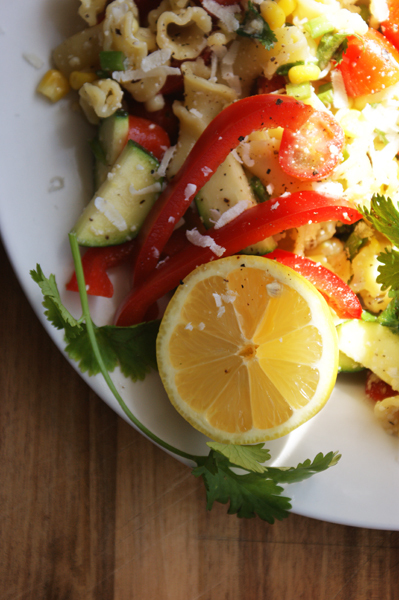 In a large bowl gently mix together pasta, cherry tomatoes, zucchini, red pepper, corn, green onions, and cilantro. 2. In a small bowl or measuring cup add olive oil, white balsamic, lemon zest, lemon juice, garlic, black pepper, sea salt, and basil. Using a fork whisk together until oil and balsamic combine. 3. Add the dressing and 1/2 cup of parmesan cheese to the large bowl of salad ingredients. Gently mix/toss with a spoon to coat the ingredients in the dressing and cheese. Add additional salt and pepper to taste. This dish can be served immediately or refrigerated, covered, for up to 24 hours until needed. Tip: If you do not intend to serve the dish immediately after preparation I recommend cooking the pasta for 1 minute less the al dente directions call for. This will help prevent the pasta from getting soggy while sitting in the dressing. I am curious if you felt like the Parmesan was a required ingredient and if you think something else (preferably a vegan choice) might provide a different depth of flavor? I am thinking oil cured black olives or capers? I absolutely think you could add either black olives or capers to the dish and omit the parmesan to great effect! I think the parmesan adds a nice salty quality to the dish that you would want to maintain. However, I think something like the capers would do the trick nicely. Mmmm I love capers…. Another thought is that you could try add nutritional yeast to the dressing. From what I understand this creates a very cheese like effect while still being vegan. I admit I haven’t yet experimented with it myself though. My younger son is actually quite allergic to dairy so I probably will at some point. Let me know how the dish turns out with your substitution!